A very nice Scott #50 unused hinged stamp of Tonga. Stamp appears sound fault free. The fee will be added to the invoice. Rather heavily hinged, vertical creasing and off centre but a scarce stamp (SG £110). Tonga britannique, 1942-1951, Stanley Gibbons, # 74 / 87 (complet) – 92 / 100 (complet) neufs , séries complètes, recherché, TB. British Tonga, 1942-1951, Stanley Gibbons, # 74 / 87 (complete) – 92 / 100 (complete) mint MH, full sets, sought after, VF. Mint hinged (MH) - Unused stamp but has been previously hinged. Mint no gum (MNG) - Stamp appears to be unused but has no gum. Unmounted mint (UM) - Stamp is unused and has never been mounted. Check all35 PHOTOS for EXACT content, what you see is what you get. MLH/MM (etc) - a mix of MLH and MM with the majority being MLH. MLH - Mint Light Hinged - lightly hinged no hinge remainders. VFU - Very Fine Used. MNG - Mint No Gum. MVLH - Mint Very Lightly Hinged - almost invisible signs of having been hinged. TONGA 1895. King George II 7½d.Orange-Yellow. MINT Very Lightly Hinged - Full Original Gum. made with love by. Catalogue Value £45 . Tonga 1897 QV 5s black & brown-red (wmk sideways) very fine used. SG 53a. Sc 52. Tonga 1897 QV 5s black & brown-red (wmk sideways) very fine used. Gibbons # 53a. Scott # 52. Topic Christianity. Year of Issue 1997. Sent from Niuafoou to Petaluma, California. ½d. (x4), 1d. (x54), 2½d. (x46), 3d. (x36), 5d. All clean UHM/MNH. SG Cat £500 . OHMS “Treasury” cachets. 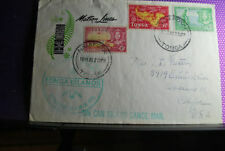 Large undated “TONGA/OFFICIAL PAID” in purple. Any catalogue information quoted is taken from Stanley Gibbons catalogue. Tonga 1943 KGVI 2s 6d deep purple superb MNH. SG 81. Sc 80. Tonga 1943 KGVI 2s 6d deep purple superb MNH. Tonga 1951-1966 Mint Selection with Overprints and High Values - Excellent! Tonga britannique, 1953-1961, Stanley Gibbons, # 101 / 119 neufs , séries complètes, recherché, TB. British Tonga, 1953-1961, Stanley Gibbons, # 101 / 119 mint MH, full sets, sought after, VF. = MH = neuf avec charnière / mint hinged. Weaving is featured on this stunning 4 stamp mint set, issued by Tonga in 2002. 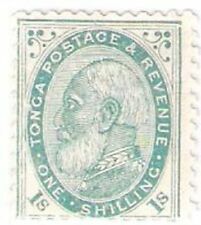 Tonga 1895 2 1/2d dull rose mint o.g. Year date missing. Backstamped SYDNEY 17 OCT 1896. Small nick at top. Opened at left and reduced slightly. MOUNTED MINT. 1942-49 Set to 5/-. UK RECORDED (UPTO £100 TOTAL) £2.00. UK ORDINARY (UPTO £40 TOTAL) £1.00.